Ipratropium is useful in treating the patient with asthma and chronic obstructive pulmonary disease. Ipratropium will act as muscarinic receptor antagonist. Ipratropium will inhibit/ block the stimulation of the muscarinic 3 receptors in the lung. This will result in the bronchodilation due to the relaxation of the bronchi smooth muscle. 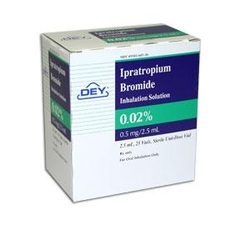 The most common side effects of ipratropium may include sedation and dry mouth. The side effects are minimal due to its minimally enter the systemic circulation.